Book 2 of the "Bloodsounder's Arc"
SYNOPSIS - History, Family and Memory… these are the seeds of destruction. FL Speak - Book 1 of Bloodsounder's Arc was a gem. It led nowhere, didn't bank on promises to fail and had a cast of ruthless killers you wouldn't want to be stuck with. Without a sound plot, it stood tall as first of the trilogy or even as a standalone. Book 2, however, doesn't. Whatever sense of lull you were accustomed to (although less truly), this book picks up the pace in action and story line at a break neck speed. To rehash, we have a young scribe, unsullied in warmongering who has been hired to chronicle the deeds of a certain Slydoon company. If book 1 was his trial of fire, book 2 leads him straight to the depths of fiery hell. The Slydoon have returned to their homes. Homes that are familiar and filled with political betrayals and memory magic. Wars, lots of it, on almost every page to satisfy your thirsting pangs of action and swear words. 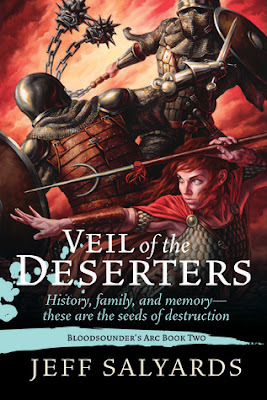 Veil of the Deserters will take you on a ride to the unknown, literally unknown places that you have not encountered in book 1. Political intrigue, treachery and good ol' betrayal at its finest. I must say the good Captain Killcoin and his Syldoon has grown on me. Arki, not so much, despite his lack for not trying. An empire awaits. The Syldoon wait. And the schemes and plots twist and turn.